"Life's a laugh and death's a joke, it's true/You'll see it's all a show/Keep 'em laughing as you go/Just remember that the last laugh is on you - ." What do you get when you lock a History student, one Medical student, 2 English majors and a Law school dropout together in a television studio? "Fear, surprise, ruthless efficiency, and an almost fanatical devotion to the Pope." A&E has gathered up remnants of Pythondamonium for completist fans in this 2-disc set. There's some great material here, featuring a variety of celebratory programs and a superb lost German episode. 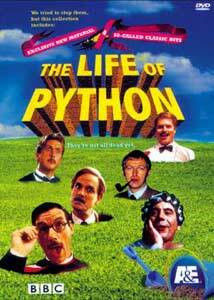 Bookended by an Eddie Izzard intro and outro, as well as a bit of contemporary Python nonsense/brilliance, the first piece is a retrospective of this legendary comedy troupe through clips, interviews and behind-the-scenes anecdotes. The surviving members discuss their journey from the creation of the series and the inner-workings of the team vs. the BBC; their feature-length exploits; the loss of Graham Chapman, and their obverse speculations on the future. No one here seems idly sentimental—not exactly a teary sort of lot—so the body of the program is an interesting mix of very individual reminiscences and emotions. It is curious to note which topics they seem comfortably nostalgic about and which ones leave them a bit squirmy: I observed an innocent pleasure in those recalling Terry Gilliam's arrival on the scene, whereas signs of restraint overlay memories of how the 5 Brits originally banded together. As with any group of creative brilliance whose halcyon days have come and gone, they are irrevocably tied to their success—and each other—and there's bound to be emotional baggage. Thankfully, they do not open those bags and air their laundry in public; instead, they impart the sense that it was all a lot of exhaustive, unappreciated hard work for those bleeding BBC bastards - sorry - I mean, a good bit of fun while it lasted. There are a few new sketches on both ends, with Carol Cleveland in one marvelous but brief spotlight. These skits are the closest we may ever come to a true reunion, as Terry Jones marks at the close: "This is it. Sorry, chaps." The last of these sketches serve as segue into Pythonland, a featurette that plays on Michael Palin's more recent travel series (Around the World in 80 Days, Full Circle), while documenting location sites of some of MPFC's most popular sketches. Actually well done, this piece overlays contemporary shots with the original filmed versions, with Palin imparting tidbits of production history as he goes. Spots include the quay at Teddington Lock (Fish-Slapping Dance); Thorpebank Road (New Cooker Sketch and The Ministry of Silly Walks) and Ealing, a borough much (ab)used by the boys (Climbing the Uxbridge Road, Hell's Grannies). It ends at the beginning, with Palin wading out into Poole Harbour, Dorset, from the exact spot of his "It's" man's emergence, 30 years ago. A few more interim sketches, including gorillas that can now (30 years on) use four letter words; the commandeering of BBC1 by BBC2, and the biographical question, "Who was Monty Python?" With its own (contemporary) intro sketch, a lost Python May Day Special is unearthed from something called Euroshow '71, a "showcase of the best of European TV Variety" (as described by Cleese in the intro; the packaging calls it the "Pan-European May Day Festival"). The piece features a hilarious MPFC tribute to May Day celebrations across Great Britain, heretofore unseen. An untitled tribute by Trey Parker and Matt Stone, creators of Comedy Central's South Park is next (02m:14s). Cartman and Kyle lend their own twist to one of MPFC's most brilliant sketches, using Kenny as their prop. If Cartman thinks his own "puppeteers" are cruel, he learns there are worse fates as he breaks the 4th wall.... A live action sequence follows, but this segment is too short, so I will say no more: it's funny, just watch it. "In a world where even the most talented vocalists struggle for success, this musically-challenged group unwittingly pulled off one of the cult classics of the century." Rock star Meatloaf hosts a secondary retrospective of the troupe's musical highlights and live performances, with interview snippets nicked from the body of the disc's main event. A few of the songs featured are: The Lumberjack Song ("I cut down trees, I skip and jump/I like to press wildflowers/I put on women's clothing/And hang around in bars - . "); the tender and inspiring Sit on My Face ("I love to hear you oralize/When I'm between your thighs/You blow me away - !") and the always enchanting Every Sperm is Sacred ("Let the heathens spill theirs/on the dusty ground/God shall make them pay for/each sperm that can't be found - ."). One more closing bit, and Palin drags in for the last word—sort of. The Lost German Episode—"Schnapps with Everything"
" - .Professor Thomas Heuchowitz lectures on Business Studies at the Bertenberg Institute. Son of the famous industrialist, he's always slipping into a bit of someone, blonde or brunette—if it goes, he chases it." This is truly a lost treasure! Fans know there were 2 episodes filmed specifically for German television: the first in German, the 2nd (thankfully) in English. Since the original airdate, the latter has only aired a few times in various venues around the world. Thanks to A&E, it is in our hands now, and I, for one, am grateful. In John Cleese's last MPFC performance, he kicks off this excellent episode (after a short opening William Tell sketch) as a journalist reporting on Horny Financial Experts. He seems compelled to ask, "Why are so many of these top financial experts so keen to get into bed with young girls?" (Maybe the old boy needed a break, no?) A unique title sequence appears next, followed by The Sycophant Show. Somehow, this German-oriented show tilts toward the American West for the next 4 sketches: Mice Preserving, Mice Wranglers (featuring "tough and hardened 'mouseboys'"), a Gilliam mouse stampede and Panning for Chickens, which includes a brief but superb Western accent by Chapman. Another animation takes us back to the fatherland where German philosophers battle it out with their ancient Greek counterparts on the futball field, assisted by a few international guests. Buying a Hearing Aid is the usual, "annoying" sort of Python rubbish, and the final Happy Valley Fairy Tale, featuring Connie Booth and a dead rabbit, is a story for the ages - well, based on language, anyone over 18. This is a solidly clever entry in the Python catalogue, deserving of the anticipation built around it. Chapman is brilliant and the rest are in top form. Shot on film in Germany, mostly on location, this is in some ways more closely related to their feature-length films that followed than their home program. Strongest Moment(s): The gang costumed in various ways to appear more German, especially Cleese at his Hitler-esque best, acting completely batty. Weakest Moment(s): The animations seem less than Gilliam's usual, classic work. Episode rating: 4 dead parrots out of 5. Image Transfer Review: The source materials collected for the first disc range from studio to location, video to film over the course of 30 years—overall it has been well-preserved and is comfortable enough to enjoy. In an "inside" sort of documentary like this, I personally am not convinced of the importance of representative footage being meticulously restored; the clips are clean, their information intact: they are suitable for their purpose. The condition of Fliegender Zirkus #2 is quite well preserved, considering its time "underground." In many ways, it is in better shape than most of the regular BBC episodes, having been completely shot on film. Audio Transfer Review: The audio transfer falls within acceptable ranges, similar in its variety to the visual materials. The DD 2.0 is serviceable, with no obvious annoyances. Really, nothing remarkable either way. The audio on Fliegender Zirkus #2 is also in good shape, with minimal noise in some of the al fresco scenes. Extras Review: This set is actually an extras package itself, so there is less than has been included on the previous episode discs. Disc I has 12 chapter stops; Disc II has the usual but spare "Loony Bin" containing an Olympics sketch from Fliegender Zirkus #1, in the original German with black bar subtitles in English and another in a line of double trivia tests. The packaging steps away from the standard created for the series, I assume in an attempt to also appeal to the MPFC film buffs as well. This is a wonderful wrap-up to A&E's presentation of Monty Python's Flying Circus. Both the lost episode and May Day sketch make this an important set for collectors, and the anniversary stuff is good enough fun as well. Although I feel it was a blatant and garish marketing ploy to give Fliegender Zirkus #2 its own, sparse disc and package it outside the "Complete Set", if I consider these 2 discs as companion "extras" to the whole, it is an easier ploy to swallow. "So remember, when you're feeling very small and insecure/How amazingly unlikely is your birth/And pray that there's intelligent life somewhere out in space/'Cause there's bugger all down here on Earth - !"